EchoTrack Inc., a privately held Canadian corporation headquartered in Ottawa, was founded in 2003 by Rhonda Millikin, a respected ornithologist with extensive field experience. 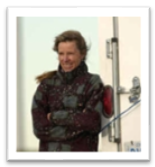 In 1999, Rhonda initiated her Ph.D studies in Physics and Environmental Studies, choosing Canada's Royal Military College in Kingston, Ontario, for its depth of expertise in remote sensing and control systems. Her objective was to better adapt and integrate military-based technologies for civilian use in wildlife monitoring and control. This unusual inter-disciplinary approach led to the founding of EchoTrack and the development of a technology with several unique innovations based upon Rhonda's research. To observe and understand the behaviour of airborne populations, and to identify what animals are present and isolate their flight path, EchoTrack integrates advanced radar and acoustic technologies with its unique and patented algorithms. The result is a comprehensive census of the airborne wildlife and its flight behaviour.